Virginia Democratic Gov. Ralph Northam couldn’t precisely answer whether he supports abortion until birth and suggested an infant could be born and then the mother and doctor could discuss what should happen next, in a Wednesday morning interview. “If a mother is in labor, I can tell you exactly what would happen. The infant would be delivered. The infant would be kept comfortable. The infant would be resuscitated if that’s what the mother and the family desired, and then a discussion would ensue between the physicians and the mother,” Northam said in a WTOP interview. Aborting a baby after it has been born is illegal. His comments come after Democratic Virginia Delegate Kathy Tran introduced HB 2491, or the Repeal Act, in January. The legislation seeks to repeal the state’s current restrictions on late-term abortions. The bill would allow a doctor to perform an abortion when a woman is dilating, meaning she is about to give birth. If passed, the measure will do away with the state’s requirement that second- and third-trimester abortions be performed only to preserve the health or life of the woman. A woman seeking to abort would no longer need to obtain an ultrasound before having an abortion, under the proposed law. Currently, three physicians must conclude that a third-trimester abortion is necessary to preserve the health or life of the woman. Those requirements are stripped under the proposed legislation, which also removes the state’s mandate that second- and third-trimester abortions be performed in hospitals. The Repeal Act saw its first subcommittee hearing Monday. “Clearly, this kind of legislation is an attempt to create legal infanticide as viable babies are aborted to the cheers of abortion extremists,” Students for Life President Kristan Hawkins said in a statement. Seems to me Ralph Northam, the @GovernorVA needs to resign. Hard to come back from advocating infanticide. #NorthamResign. Roe v. Wade gave women the right to abort up to the point of fetal “viability,” a term that continues to foster debate as neonatal care advances. 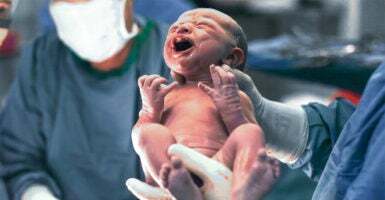 Physicians generally point to between 22 and 24 weeks as the point at which a newborn baby can survive outside the womb. “Legislators, most of whom are men by the way, shouldn’t be telling a woman what she should and shouldn’t be doing with her body,” Northam also said in the interview. The average time from ovulation until birth is approximately 38 weeks. Northam did not respond to The Daily Caller News Foundation’s request for comment in time for publication.